National average asking prices of newly-marketed property rise by 0.7% (+£1,981) this month. This is consistent with the recent norm for this time of year which saw an average 0.6% February uplift over the previous two years. 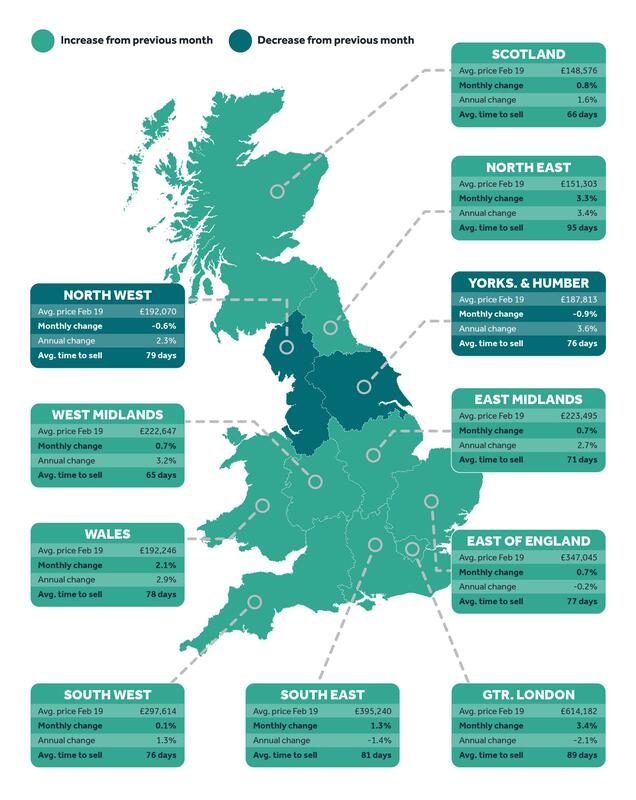 However, as we enter the traditionally more buoyant spring market the average annual rise of 0.2% (+£714) is the most subdued that Rightmove has recorded at this time of year since 2009. As a result, and with average wage growth now running at an annual rate of 3.4%, buyer affordability is improving at the fastest rate against average new seller asking prices since 2011. Our first market update of 2019 and the market has started positively in the local area. The political uncertainty surrounding the UK doesn’t seem to be impacting on local homemovers and in January we registered over 200 new applicants looking to purchase property locally. Against January 2018, we saw over an 80% increase in new properties being placed on the market for sale and sales agreed saw a 150% increase against last year. We also saw a 45% increase in properties completing during the first month of the year against last January.